Should there be a strategic reason behind why we received the specific modules we did, I was quite sure what mine was. Rewinding to the application process of Curating-Lab 2012 in July, one of the tasks was to write a review on a chosen exhibition out of a list of three. I picked PANORAMA: Recent Art from Contemporary Asia at Singapore Art Museum. Two languages were used in the opening paragraph, followed by an analysis on the exhibition layout, exhibition flow and design, curatorial concept, and representation of the concept with artworks. The review ended by asking readers to “be conscious that it is never an easy task to take the first step in creating a new canon and define a position in Art, especially in Contemporary Asian Art”. These fit nicely into Module 5. Module 5 first appeared to be simple. Language and Definitions give birth to Associations, which leads to Presumptions, and thus form Restrictions. One reads the word ‘apple’ and straightaway define it to be either the fruit or the brand made famous by Steve Jobs. With the former, one is triggered to think about apple crumble, toffee apple, Granny Smith, teacher’s day, Adams & Eve, Snow White etc. With the later, one is triggered to think about iPhone, iPad, Mac Book, Apps, competing models and brands, technology advancements etc. However, ‘apple’ can also be (the name of) your distant cousin or a fashion boutique down your block. This is where Misunderstanding enters the picture. Working with one language brings you to this equation that reminisce the butterfly effect. Imagine what it will be like working with more than one language! Issues on locality of languages and being lost in translation are inevitable. Being fluent in English Language, Mandarin Chinese (simplified written Chinese) and Cantonese (traditional written Chinese), juggling linguistic matters is part of my common daily affair in both the private and professional realms. Often when translating English to Chinese and vice-versa, the product of translation makes no sense if the context is ignored. Few phrases are able to have direct one-on-one translation. Let us take the English term ‘Art’ for example. ‘Art’ can be translated to ‘yishu’ (艺术) and ‘meishu’ (美术) in Chinese. Yishu carries a connotation that includes all kinds of Art, i.e. painting, sculpting, poetry, literature, dance, theatre, opera, cinematic, architecture, landscape architecture, flower arrangement. The list can go on, as yishu ultimately refers to any skills and practices that are deemed upon as forms of a higher humanistic expression. The term yishu can be traced to origin from the Han Dynasty (circa 206 BC – 220 AD). Each syllabus refers to four kinds of abilities / activities. Yi (艺) refers to literature writing [shu (书)], mathematics [shu(数)], archery [she (射)], and ability to ride a horse or drive a horse carriage [yu (御)]. Shu (术) refers to the practices in medicine [yi (医)], carpentry [fang (方)], foretelling [bu (卜)], and divination [shi (筮)]. Evidently, ‘yishu’ or ‘Art’ in the context of Chinese culture and history relates very different to our nowadays understanding of the term. Yishu was associated with technique-based activities, rather than a visual element or form of expression. However, this does mean there has not been any conceptual development or awareness in artistic expression. Cultural literacy (文化素养) was seen as an essential quality of the scholar-bureaucrats or literati of imperial China. The level of cultural literacy works similar to military rankings. In order to prove their level of cultural literacy, competence in ‘qin qi shu hua’ (琴棋书画) is measured. Qin (琴) refers to the stringed-musical instrument guqin. Qi (棋) refers to a board game called weiqi, known as Go in English and sometimes in modern colloquial terminology as 'Asian Chess'. Shu (书) refers to calligraphy, but should not be confused with the shu mentioned earlier in the passage. The earlier refers to the ability to articulate and write cohesively and the later refers to poetic expression, both in content and form (brush works and intensity of ink). Finally, hua (画) refers to painting, and is unarguably the greatest measure of individual creativity and cultural literacy. These four activities / abilities have existed as individual entities since the Three Sovereigns and Five Kingdom period (circa 2600 BC - 2110 BC), and later placed together during the Tang Dynasty, hence forming what we know now in English-translated terms – The Four Arts in Historical China. Another translation for ‘Art’ is ‘meishu’ (美术). ‘Meishu’ has a closer reference to ‘Fine Art’, narrowing down to paintings, sculptures, literature and music. The term meishu was first used by Cai Yuanpei in the New Culture Movement, which occurred in the early 20th Century. Broken down to syllabus, mei means ‘beauty’ and shu refers to a technique, hence referring to tangible objects of beauty. Towards the mid-20th Century, yishu was used as an analogy during a Communist Party Speech by Mao Zedong in 1939, with the phrase of “The Art of War”. Later, Mao turned the term into a political agent at a speech in Yan’an (1942), where yishu / art is categorized by levels and used to reflect particular social classes. In the late-20th Century, various other associations of yishu came around. Some use it as an adjective referring to ‘being rich and varied’. Others referred to the term as an object or element that expresses and represents life and one’s soul. This last connotation is similar to what the West refers to as ‘aesthetics’. Meeting Jim Supangkat (aka Pak Jim) in Bandung, during the program’s regional fieldtrip, brought reassurance to my finds and excitement to my critical-thinking mind. Fifteen of us sat sluggishly, struggling to stay attentive in silence after a delicious hearty home-cooked lunch at the Selasor Sunaryo Art Space. It was a warm autumn afternoon with an occasional cool breeze passing by through the surrounding woods. We were seated at Bale Hadap, a pavilion inspired by traditional Javanese architecture. Agung was sharing with us a power-point on curatorial strategies and the relation of curating & space, gathered from his professional experiences thus far. Our facilitators fidget in their seats, stealing frequent glances at the brick staircase which leads upwards to the main entrance of the complex. Swift like a breeze, one of our facilitators sprang up from his seat and walked purposefully towards the brick staircase. A pair of brown loafers descended to view, followed by legs covered by denim jeans, a healthy belly tucked-away by a black belt, a simple black long-sleeved turtle neck… Pak Jim is a tall angular man, wearing circular thin framed glasses, a tidy full moustache and beard and matching white hair tied neatly into a short ponytail, and black bowler hat adorned with a red speckled feather. Pak Jim sends off an edgy rocker aura. Among ourselves, we silently nicknamed him ‘The Indonesian Art Godfather’. During the dialogue, Pak Jim elaborated upon his previous writings and theories. He also shared with us his decision in becoming an art critic and curator, shedding away his artist-self, and the importance of writing a local art history aside from following Western theories, which often is viewed as the mainstream. It was through this rare moment of encounter and exchange that I came to learn to view my earlier thoughts on yishu in a different angle. 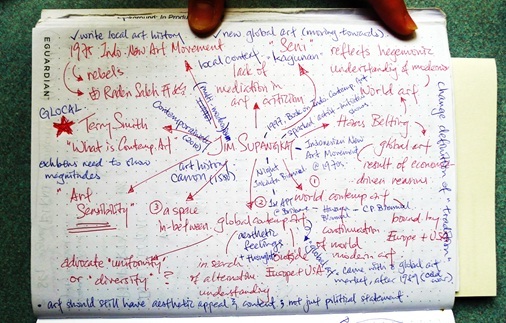 In September 2009, Pak Jim’s The Seni Manifesto was published on-line in Global Art Museum website. By tracing the linguistic and philosophic basis for artistic discourse in Indonesia, as compared to a Western ideology of art through theoretical analysis on the key phrases of “seni”, “seni rupa” and “kagunan”, Pak Jim pointed out the necessity of cultural translation to fully understand the developments in art and art history, without having to resort to the persistent thesis of cultural incommensurability. Through the manifesto, Pak Jim introduced me to Stephen Davies and Denis Dutton, their debate, and his treatment for seni, leading us back to Dutton’s question – Do they have our concept of art? Looking back to [Art = Yishu]?, yishu has evolved through historical and cultural contexts of China into a term we can now closely link with the Western terms 'art' and 'aesthetics'. The essence of creativity and artistic expression in Chinese art has always been around, and was merely given a different name to yishu and known as other nouns. These qualities survived through time by being infused into the Chinese culture and daily lives. Hence, answering Dutton’s question – Yes, we do share the concept of art, but on different trajectories, particularly time. Throughout the world, regardless of cultures, philosophers did not anticipate that there would be other cradles of heritage that developed differently and provided alternative thoughts. This is particularly so in the Euro-American realm, as Pak Jim also mentioned in his manifesto. It was only when mechanics and technologies enhanced mobility, did continents and their people became closer to each other. The birth of the World Wide Web in the early 1990s sparked off a pivoting change to accessibility of information, mode of acquiring knowledge, and dialogue exchange. A myriad of discourses were generated, mainly from the West and brought back to the homeland of travelers and visitors of the West. One of the pressing discourses we are situated in by default is the topic of Modernity aka Contemporaneity. Do all cultures undergo the same range of cultural changes in a uniform pattern that result to Modernity? Applying the treatment of yishu and seni into the concept of Modernity & Modernism, I am sure you are able to now confidently point out that there is neither one single form nor one single definition to Modernity & Modernism. Modernity is a condition of the ‘modern’, whether it may be a social or political stance for example. Modernism is a noun that describes the character or quality of thought, expression, or technique of the ‘modern’. Coined by Western cultures, Modernism marks the beginning of rationalism, reasoning, scientific thinking and parting with traditional belief. All of these were defined specifically to historical, social and political realities in Euro-America. When one pauses to contemplate on rationalism and reasoning, do the Middle East and China not have a longer history, i.e. in relation to Mathematics and Medicine? The connotations Modernity & Modernism bring with them are very much rooted in Western cultures egoism. Hence, direct transfer of the terms will not work in our local context in Asia and Southeast Asia. We need to be mindful about the implications and perhaps restrictions that go hand-in-hand with the terms, using our sensibilities as judgments, and not forgetting our own unique aesthetics and philosophies. In order to mindfully apprehend the definitions across different languages, one need to break away from Associations, abolish Presumptions, and look into the context in which the term was created and used. Such a task is where dictionaries come into the picture. Being time specific, the definitions of terms need to be updated accordingly. In spite of this, how do such anthropologic and linguistic theories have to do with Curating? “A curator takes up the role of a challenger”, as Dr. Patrick Flores shared with us during one of Curating-Lab 2012 intensive workshops. S/He is a contemporary explorer, where written and verbal languages and visual languages are weapons. Curators push cognitive boundaries, “leading their audiences out of comfort zones”, prompting them to gain awareness of issues oblivious about. In succeeding these, curators either communicate verbally (i.e. guided tours, dialogues and round tables), through text (i.e. curatorial statement, essays, wall text, labels), or visually in the form of exhibitions. By doing so, curators also act as mediators, between the shown object and audience. Just like lawyers, who take up the role in presenting the law in an easily comprehensible fashion, art curators present art history and art in an accessible and understandable manner. Manifesto is an excellent example. Pak Jim curated this exhibition with the curatorial aim to explore the Indonesian understanding of seni and seni rupa. Opened at the National Gallery in Jakarta (May 2008), showing over 350 artists from Indonesia, Manifesto was the visual form of The Seni Manifesto. This was Pak Jim showing and telling his seni manifesto using no other objects than art / artworks themselves. A topic that first appeared to form a succession of simple equations, turned out to be a Pandora box. Conversing with my fellow curating-lab mates, it doesn’t seem like a coincidence that all of us joined the program with several questions in mind – What is curating? What kind of qualities do Curators have? Can you curate books and architectures? – but with three-quarter of the program completed, we carry with us more than our initial mental capability can hold. In this paper, we have looked closely at the problems of language and derived a possible solution to minimize the effect of the cause. However, the relation of language and exhibition can be further explored. At this point in time, I am unable to present a respond as I am still on the quest. I can only share with you that my cognitive process has now join arms with the practical areas of exhibition-making. Questions like ‘role of language in an exhibition’ and ‘contributing factors in exhibition-making’ are embedded in the process of writing the curatorial statement and labels, where the use of wall text remains a debatable issue, and designing the layout of our show. It will be the final assessment to this program, available on view in January 2013. Perhaps Professor Apinan Poshyananda’s drop of wisdom is true. Upon picking up the task of curating, we are on a long labyrinth path. The review began by describing PANORAMA with a metaphorical reference to “Rojak” – a word in Malay language meaning “wild mix”, and the name of a local bite-to-eat. Agung Hujatnikajennong is a lecturer at the Department of Art, Faculty of Art and Design, Bandung Institute of Technology, Indonesia. Having concluded his undergraduate (2001) and graduate (2006) studies, he is now doing his doctoral research on Indonesian art curatorship at his alma mater. Agung also works as an independent curator, and has just completed his term as curator at Selasor Sunaryo Art Space. The debate between Dutton and Davies revolves around (1.) the understanding of the term ‘aesthetics’, (2.) manner to view and comprehend non-Western artworks and terminologies, and (3.) the concept of art in Western and non-Western context. For further reference, please refer to their individual publications: Stephen Davies, “Non-Western Art and Art’s Definition”, Theories of Art Today, Nöel Carroll (ed. ), The University of Wisconsin Press, 2000 and Denis Dutton, "Chapter 5: But They Don’t Have Our Concept of Art.”, The Art Instinct: Beauty, Pleasure, and Human Evolution, New York Bloomsbury Press, 2009. The West here refers to Europe and America. Definition of Contemporaneity is 1. modernity; 2. the quality of being current or of the present. Curating-Lab members met during a closed-door round-table at Visual Arts at Temenggong, 9 Oct 2012.